News this week that Gross Margins at Patisserie Valerie were ‘constant and out of line with peers’ confirms that everyone was ‘asleep at the wheel’, not just Luke Johnson. This gives me the perfect opportunity to jump on my soap box and promote Gross Margin percentage (Gross Profit as a % of Sales) as the most important measurement for a trading business (with cash controls a very close second). Gross Margin gives a window to how well a business is managing its pricing strategy, its purchasing and issues such as stock control. It is all there behind that one simple figure. It’s a pivotal part of my ‘back of the fag packet’ approach to appraising a business by looking at performance against its ‘break-even’ levels. Throw away those impractical graphs that still get used in most books about ‘Understanding Small Business Finance’. It only takes minutes (if you need to do things quickly) to understand what direction a company is heading in and what its prospects are. Huge, weighty, business plans and projections can be efficiently checked, challenged and validated by a simple check on how gross margins have been treated. The accountancy profession: where are you? Rarely do professionally produced accounts show the gross profit percentage – leaving me to work it out quickly before looking further! Simply ask the owner of a trading business what their Gross Margin % is and how it is moving, and you will open up a way of finding how close they are to their business. Answers range from “If you want to know anything like that you will have to ask my accountant” to “Gross Margins are currently about 63% which is good for our sector, but they have gone down a bit as we had to reduce prices on one product line”. As an investor or banker which of these businesses would you rather back? You almost don’t need to know anything else! I get such a good feeling when I see one of my consultancy clients where I’m monitoring their financials on behalf of a bank or investor and they open the meeting by saying “I know you are going to ask me what happened to the margins last quarter”! I was brought up working in a small business but became a bank manager, and a good one. I knew all the complex financial appraisal tools and credit scoring black boxes we had to use were useful for larger corporates but were inferior to the ‘Gross Margin %’ technique when dealing with smaller organisations. I eventually had the privilege of training other bankers on it too. Performance incentive schemes for company staff based on ‘Sales’ can destroy a business. 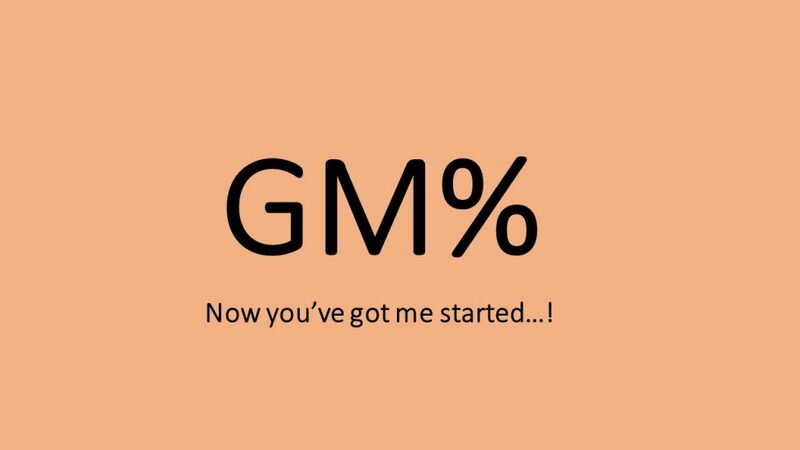 Get people to understand the principle of ‘Gross Margin %’ and build that into incentives and you can build a stronger and more profitably business and engage people properly. I could go on…. But I’ll sit down now and look at the snow outside!